Title: "Ch. 32 TET Offensive Begins, Jan. 31, 1968"
During the early morning hours of January 30, 1968 all hell broke loose across South Vietnam. The North Vietnamese Army and the Viet Cong launched their massive New Year TET Offensive of 1968. It was morning. Our company was on the northern side of the perimeter of LZ Evans (Camp Evans). The perimeter of LZ Evans had been pushed out on this side of the camp. There were no really good bunkers constructed this far out from the original bunker line. We had a foxhole in front of our hooch. We had dug the foxhole the night before when we had come in form patrol. Dirt from digging our foxhole had been used it to fill sandbags. The dirt filled sandbags had been used to build a short wall around three sides of our hooch. We were eating some C-rations while sitting on the short sand bag wall. Equipment was being checked and canteens filled. We were preparing to go out on patrol as soon as the order to “saddle up” was given. We had been out on patrol the previous day and were preparing to go out on patrol again today. Suddenly our platoon radio was alive with reports of heavy fighting in and around the old Imperial City of Hue. We had been on patrol near the city of Hue several times but never all the way to the city gates. The radio operators at battalion were relaying information down to the various company radio operators and they in turn were relaying the information down to the platoons. Rumors began to fly about how the US Marines were all trapped inside the old walled part of the city called The Citadel. The Citadel was located inside the city of Hue. The North Vietnamese and Viet Cong had the Marines surrounded and cut off. Since none of us had seen the city of Hue or the old Imperial Citadel we could only picture what it looked like. We all stopped what we were doing so that we could listen to the radio transmissions. A few minutes later all the company commanders in our battalion were called to the battalion commanders command bunker. A plan to rescue the Marines trapped in the Citadel was being discussed at brigade level. Within an hour we received word that our battalion was going to make an air assault right over the walls of the Citadel to join the Marines in their struggle against the North Vietnamese. Second Lt. Tom Dobrinska was issued a map, which included the city of Hue. He called Robert Waszak, James Shields and myself over to his hooch to look at the map of Hue and the Citadel. We were issued extra ammo and everyone was taking care to make sure all of their weapons were clean, and ready to fire. Our company commander received orders to be ready to make an air assault in fifteen minutes. Huey helicopters begun to arrive even before the order to make the air assault was issued. At this time helicopters were not kept at Camp Evans at night. They went to another location to refuel and spend the night. Our packs were to be left at the LZ here at Camp Evans. They would be flown into us after we made our combat assault over the Citadel wall. We were to be ready to board the Huey’s as they landed. At this time we still thought we were going to be landing in the thick of the fighting inside the city of Hue, in a place called the Citadel. At the very last minute we were told that there had been a change in the plans. First Cavalry gunships had flown around the Citadel to support the Marines. The gunships were receiving intense anti aircraft fire from locations outside of the City of Hue. 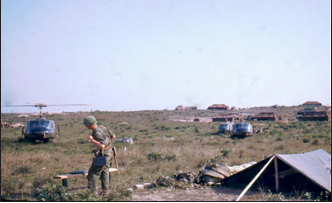 It was decided that we would be landing near a South Vietnamese Army camp, where we would be leaving our packs and moving out toward Hue on foot. We were to only carry our weapons, flak jackets, web gear, and extra ammo. We still thought we would be landing near the battle at Hue and would be involved in the fighting almost immediately. I shoved extra M-16 magazines in my ammo pouches and into all the pockets of my flak vest. Soon we were on board the helicopters and lifting off of the LZ at Camp Evans. We flew low and fast. Within a few minutes flying time we were landing in a huge rice field outside of a place known as PK-17. It was a small South Vietnamese Army outpost with concrete walls surrounding it. The small outpost was most likely something the French had built during the years they fought a war in Vietnam. A South Vietnamese flag flew from a flagpole inside the outpost. There were several old buildings with tin roofs inside the walls of PK-17. The South Vietnamese Army had two companies of men at PK-17. An American made 81mm-mortar tube and a 105mm cannon was located near the center of the outpost. PK-17 was several miles from Hue, where the Marines were still trapped in the Citadel, and fighting off the NVA attackers. We moved inside the walled camp and were ordered to leave our packs in front of an old shed that had most of its tin roof missing. We were also told that our packs would be safe there. A crew would load up all our packs, which included sleeping gear like ponchos and poncho liners, and fly them in to us later that day. I saw all of the South Vietnamese soldiers standing around smiling and looking at all of our packs which were being placed in a pile. That is when I took all my good stuff out of my pack. I put my camera and my photo album in my flak vest. A flak vest wasn’t good for much but it did help keep you a little warm in cool wet weather, and it had lots of pockets in which to carry stuff. I had a total of 20 full M-16 magazines stuffed in the pockets of my flak vest and in my ammo pouches. I also had all the letters from my wife Janet and from my family, tucked into my helmet liner webbing. I was not going to let the South Vietnamese get any of my good stuff. I knew the South Vietnamese would be going through all of our packs and stealing everything they could as soon as we were out of sight. Our battalion commander wanted to get us moving and away from PK-17, so in a very short time we were on the move, heading in the direction of Hue. PK-17 began taking fire from small arms and mortars as we prepared to move out. The South Vietnamese defenders at PK-17 were hiding behind the concrete walls, which surrounded their camp, holding their American made M-16’s up over their heads, and firing them on full automatic. They were firing into the village and across the rice paddies next to their camp. They were trying to stop the incoming mortar and small arms fire. They weren’t aiming at anything. They were just blasting away burning up their ammo! We got them to stop firing long enough so that we could move out through the village and get clear of their camp. As we moved through the village next to PK-17 we saw some dead villagers lying on the ground. Some of the dead must have been killed earlier that day as they were already being put into wooden coffins for burial. There was a lot of crying going on in the village. I guess the villagers must have thought the Americans were to blame. We moved as a battalion size force into the open rice fields, which were next to PK-17, and started moving toward Hue. Our entire battalion was moving as a unit. Lt. Colonel Sweet was in command of the battalion and he was on the ground with us. The rice fields we were crossing were some of the largest rice fields I had ever seen in Vietnam. They seemed to be miles across. We moved across several of them with no problem at all. By now it was getting late in the afternoon and soon it would be getting dark. The sky was overcast and gray. As the daylight began to fade, a light misty rain began to fall. We came to an abandoned village and an old cemetery. The battalion commander ordered us to set up here for the night. Our company was to form a perimeter around the old graveyard and dig in for the night. The other companies were dug in around the abandoned village. “B” Company dug foxholes right in the graveyard. I was expecting to hit bones at any minute, as I dug our foxhole. I didn’t hit any bones. Shortly after nightfall our battalion artillery officer decided to call in some artillery fire around our perimeter so that the gunners would have the settings recorded just in case we needed some fire support during the night. That is when we learned that we were out of range of our own guns back at Camp Evans. Either a South Vietnamese firebase or PK-17 would fire support for us. Our battalion artillery officer gave them the coordinates and ordered a few rounds of white phosphorus to be fired. We quickly learned that the South Vietnamese were not very good at putting a round where it was needed. We heard the sound of the canon and of the shell coming in. When it exploded white phosphorus landed all around us and inside our perimeter. We thought it was an enemy artillery round since it hit so close to us. A small burning chunk of white phosphorus landed on the nose of a guy in our platoon named Manuel A. Silva. I think Silva was from California. Silva usually carried one of the M-79 grenade launchers in our platoon. He was screaming as he tried to get the burning stuff off his nose. He went in the next morning on the helicopter with deep burns on his nose. Since we had left our packs back at PK-17 we were unable to put up any hooches and no one had a poncho liner to help keep them warm. Fog and a misty rain settled across the area. When I was not on guard duty I climbed down into our foxhole and leaned against the dirt wall and tried to get some sleep. Early the next morning our battalion again started moving toward the city of Hue. Black smoke could be seen rising from the city which was still several miles away. We were again crossing large open rice fields. Small villages consisting of several dozen abandoned hooches surrounded by large palm trees looked like little islands in a sea of green. We had just come out of one of these villages when an enemy sniper fired one round. That round killed our point man. We began returning fire toward where we thought the sniper was hiding but no one knew where he was for sure. The medic checked our fallen point man and began to put him into a body bag. He had been shot in the head and killed instantly. We thought the sniper was still in the trees or on the ground in the tree line along the next village. We fired some M-79 rounds into the area but the sniper didn’t make a move or fire back. A helicopter gun ship was called in to shoot up the tree line in the next village where we thought the sniper was hiding. When the gun ship came in low and fast he fired into our tree line by mistake. We suffered another KIA and several more guys wounded as a result of friendly fire from our own gun ship. We started to move out again crossing the next open area. As soon as the point platoon left the cover of the tree line, the sniper fired again. One round! Another man fell dead, shot in the head. Killed instantly. The machine gun crew next to me dropped to the ground and the machine gunner tried to fire his M-60 machinegun in the direction of the tree line. I saw him squeeze the trigger and I watched the bolt slam forward in the M-60. Nothing happened! The M-60 didn’t fire. He pulled the bolt back again ejecting a round that had not fired. Again he pulled the trigger and again nothing happened. It was then that I noticed that the latch that holds the M-60 barrel locked into position was up and the barrel was not all the way in the receiver of the machinegun. The gunner again pulled his bolt back and at the same time I grabbed his gun barrel and slammed the latch down. The next time he squeezed the trigger the gun fired into the tree line. We all opened fire into the tree line on the other side of the clearing. Here we were all firing at a tree line while lying flat on a dry rice field with absolutely no cover at all! We all jumped up and began firing into the next tree line as we ran across the rest of the open area. As we reached the tree line we found a shallow ditch which provided some cover. We still had no idea where the sniper was hiding. We held our fire while we tried to find the sniper’s hiding place. Everyone was staying low in the ditch while still trying to cover second platoon as they crossed the open area. Suddenly the sniper fired again and another man was killed. Another shot in the head. Our platoon began moving along the ditch in the direction that we thought the sniper fire was coming from. While trying to keep low we moved quickly along the ditch. The sniper must have seen us moving in his direction and got nervous. Suddenly we saw a camouflaged North Vietnamese soldier jump up out of a spider hole, which had been dug into the side of the same ditch we were all using for cover. He jumped up and ran into the bushes. It all happened so quickly, we were totally caught off guard. Everyone jumped up at the same time trying to get a shot at the fleeing sniper. Everyone was in each other’s way and we all missed him. The sniper who had just killed three of our men got away. The rest of our battalion was following us into the tree line. There was no more sniper fire. We received word to set up a perimeter for the night around this village and to dig in. This abandoned village was named Tron La Chu. We had to move through part of the village to get to the spot where our platoon was to dig in. As we moved through some old abandoned hooches I found an old green wool blanket laying in the dirt. I picked it up and took it with me. It was starting to rain and to get dark. Our packs were still back at the South Vietnamese camp PK-17. Our company medics had a few ponchos that were to be used as body bags, but no one had a poncho liner. The temperature was dropping into the 50’s at night. We dug in and ate some C-rations and set out some trip flares and claymore mines in front of our positions. We dug our foxholes in a shallow ditch at the edge of a tree line that surrounded Tron La Chu. If you crawled and stayed low, you could move along the ditch from one foxhole to the next with out being exposed to enemy fire. A medivac helicopter landed in a clearing inside of our perimeter to pick up the dead and wounded men. They also brought in cases of extra ammo and C-rations. No packs arrived. Several new replacements did arrive on the medivac helicopter. One of those new guys was assigned to our platoon. As he walked up to our positions I recognized him as PFC Curtis Scowden. He had been in the training cadre during our AIT training at Ft. Polk Louisiana, Tiger Land. Scowden told us that his orders had gotten messed up and that he was going to stay at Ft. Polk until they got his paper work straightened out. Well here he was in Vietnam. Scowden was a Spec 4 and so was I. Scowden was from St. Louis Missouri. A few days later, Curtis Scowden was to become the target for an enemy sniper. Curtis Scowden was carrying ammo between the foxholes in the shallow ditch and was moving from one position to the next when he was hit. Scowden died two days later. He was in the second squad of our platoon and I never did get a chance to say much more than “Hi Scowden” to him. I was the squad leader for first squad. It was raining harder now and very dark. Our platoon leader, Second Lt. Tom Dobrinska, and I were sharing a foxhole in the ditch. On one side of us was my squad’s M-60 machine gun with its crew of 3 men. In a foxhole to our left side were Lt. Dobrinska’s radio operator and Robert Waszak. We kept one man awake in each position at all times. It was quiet, and we managed to get some sleep. When it was my turn to rest I decided to lie in the ditch next to the foxhole. I wrapped the old wet green wool blanket around me. I was starting to feel a little warm in spite of the cold rain that was falling on us. Then I felt something bite me. Then I was bitten again. That is when I found out that I was not alone in the old blanket. There were lice in the old wool blanket. After I was bitten several more times I finally fell asleep. I dreamed about my wife Janet, and about our little Dachshund dog named Shannon. I don’t know why I would dream about our dog but the dream was so real I almost forgot where I was, when all of a sudden all hell broke loose on our perimeter. The enemy was launching a ground assault against us in the middle of the night! RPG’s and mortar rounds were exploding inside our battalion perimeter. Guys were yelling and bullets were hitting the trees behind us. We kept our eyes peeled to our front. We were expecting to see the enemy pop our trip flares at any second. We were ready to fire at anything that moved in front of us, but all the fighting was going on behind us on the other side of the perimeter, near the far side of the village. The ground assault lasted only a few minutes but several of our men were killed and a number more were wounded. The fighting stopped and we spent the rest of the night keeping watch from our positions. As daylight started to turn the blackness into light, several medivac units came in, and picked up the wounded but left the dead to be picked up later. Every time a medivac unit came in the enemy would open fire from the village near our perimeter. The enemy also began to shell our battalion perimeter with mortar fire every time they heard an approaching helicopter. Several more men were wounded during the day from the mortar fire. We were asking for support from our artillery back at the firebase, but we were told we were out of their range. They were trying to get some of the big guns moved into range but the move was taking far longer than they had expected. The weather had closed in. A light rain was falling and it had become foggy and very overcast and cool. Suddenly one of the men in second squad, which was only a few meters away, was hit by a sniper and killed. We had no idea where the fire had come from. We fired several rounds from an M-79 grenade launcher into the trees on the other side of the clearing in front of us, but received no return fire. About an hour went by before the sniper fired at us again. This time he missed his intended victim, but we all took cover and again tried to locate the sniper. There was a concrete tomb about 200 yards in front of us and we felt that perhaps the sniper may have been on the roof of the tomb. We blasted the old tomb several times with M-79 fire but saw nothing. To this day I don’t know where the enemy sniper was hiding. Lt. Tom Dobrinska had a pair of binoculars and we were taking turns using them to scan the wood line across an open field in front of us. We were hoping to catch just the slightest bid of movement of the hidden sniper. Off in the distance, across one of the large rice fields, we were able to see several water buffalo crossing the open area between villages. They were a long way off, and without the field glasses they were very hard to see. We thought it was strange that the animals would be crossing the field by themselves especially with all the firing going on. We called for our company sniper. A man named Carl Johnson, who had been given sniper training back at An-Khe was our company sniper. He carried a special M-14 rifle equipped with a scope. Johnson wore thick eyeglasses all the time. Hardly the type you would picture as a sniper. Thick glasses or not Johnson was deadly with the M-14. We showed him the water buffalo and Tom Dobrinska told him to try to hit them. Johnson took aim through his scope and fired. One animal fell on the first shot. The rest of us were taking turns watching through Lt. Tom Dobrinska’s field glasses. From behind the fallen animal a North Vietnamese soldier with an AK-47 rifle ran for cover. Johnson fired several times as the man ran for the tree line. The enemy soldier fell in the rice field. Several other NVA soldiers who were also using water buffalo for cover ran for the tree line to escape the deadly fire from Johnson. We spent two days in our defensive positions taking sniper and mortar fire and running short patrols. The enemy snipers were very good at their deadly jobs. They would only fire once in a while and only from a location that was very hard to detect. Second Lt. Tom Dobrinska and I had enlarged our foxhole some, but it was still very small for the two of us. During the daylight hours we remained crouched down in the hole or on our stomachs crawling from one hole to the next along the ditch. There was not enough room in the foxhole to wear our web gear, so we kept our canteens, grenades, and ammo pouches where we could reach them on the dirt in back of the foxhole. Late in the afternoon I decided to get out of our hole to go get some C-rations. My legs were cramped up from crouching down in the foxhole for so many hours. I reached behind our foxhole and pushed my web gear out of the way so I could climb out of the hole. Just as I started to get out of the foxhole, something caused me to drop back down into the hole. I thought someone standing next to our foxhole had pushed me down. No one was there! The sniper must have been watching me through his riflescope. As I unexpectedly dropped back into the hole, he fired. His bullet hit my web gear and made a hole in the dirt behind the foxhole. To this day I feel there was a third man in the foxhole with Lt. Tom Dobrinska and I. I can’t explain the push I got on my shoulder that day, but it happened, and it was real! Lt. Tom Dobrinska and I remained in our foxhole until it was nearly dark. It was then that I heard my friend Rob Waszak call my name. He said, “Hey McLain do you want some coffee?” I could tell the sound of his voice came from behind a couple of big palm trees, which were a few meters behind our foxhole. I jumped out of the foxhole and took cover behind the trees with Rob Waszak. Waszak had filled an empty c-ration can with water from his canteen and was heating it over a heat tab. He added some instant coffee from a c-ration packet and stirred it with a plastic spoon. That was the best coffee I have ever tasted! I had not had anything to eat or drink all day. The battalion commander, Lt. Colonel Sweet, knew we were out of range of our artillery battery back at Camp Evans and most importantly getting the big guns moved closer to us was taking far too long. The NVA had a number of 51 caliber anti aircraft machineguns set up in the area around Hue. They were using them to shoot down our helicopter gun ships, medivac, and supply ships. The helicopters that were still flyable were sitting on the ground back at Camp Evans, out of fuel. We were on the ground, outnumbered and surrounded by the enemy. The enemy forces in and around Tron La Chu were estimated to be four to five thousand. We were outnumbered by at least four to five to one. With no artillery or gun ship support it was only a matter of time before the enemy would launch more ground assaults against our perimeter. Lt. Colonel Sweet knew that we had to get out of there if we were to survive and continue our mission against the enemy at Hue. Lt. Colonel Sweet had also received word that another large enemy force was moving toward our defensive position and would join those surrounding us. The enemy could then launch a combined attack against our perimeter. The enemy also knew we were not able to use our artillery since we were out of range. As darkness fell on another day in Tron La Chu, our platoon leader received word that we would be pulling out of our defensive positions after dark. It was a very risky and daring move to try to escape from the encircling enemy force. If the enemy spotted us away from our perimeter and out in the open we would be gunned down. After dark we pulled in our claymore mines, but left the trip flares untouched in front of our positions. We gathered up all our equipment and all the ammo we could carry and began to get ready to move out. It was a very dark night, which was to our advantage. The sky was overcast and there was no moon. I am sure the enemy forces surrounding our perimeter could not see us moving around getting ready to move out. We had eleven dead men and a large number of wounded that we had to deal with. Our battalion medics gathered up all eleven of the dead men who had already been placed in body bags or wrapped in ponchos, and placed them in the mortar pit near the center of our perimeter. The mortar platoon then buried the dead men under a couple feet of dirt. All the extra ammo and mortar shells, which we could not possibly carry with us, were placed in another hole inside our perimeter. A large stack of C-4 plastic explosive was placed under the pile of ammo and mortar shells. A long time fuse and a blasting cap was inserted into the plastic explosive. We all hoped we would be long gone when the charge went off. We had a number of wounded men that could still walk and some that had to be carried on litters. The wounded that were still able to walk were not given any morphine to stop their pain. The morphine would have caused them to be unable to walk. Everyone was ready to move when the order came. I had two boxes of extra machine gun ammo and two claymore mines tied to me along with all my own field gear. I was carrying my M-16 rifle and 20 full magazines. Many of the extra magazines were stuffed in the pockets of my flack vest. I also had my 45cal. pistol and a couple extra clips for it. At the appointed time the battalion began making its exit from the perimeter close to our foxhole position. All the men walked past 2nd. Lt. Dobrinska and I as they set off into the darkness. The point man, that dark night was a soldier named Hector L. Camacho. Camacho followed a shallow irrigation ditch that was just to the left of our fox hole. The irrigation ditch led to a large open field. The plan was to move quietly and as quickly as possible right out in the open rice fields and away from our defensive perimeter. Most of the fields we would be crossing were muddy but not flooded. Green rice plants about a foot high covered the fields. A few of the fields were flooded with water which made walking much harder. We were told not to fire our weapons for any reason. Even if we were fired upon from the tree line we were not to fire back. Only the company commander could give the order to fire our weapons. Everyone was very tired and many of the wounded were in great pain, but not a sound was made except for the sloshing of our boots in the mud. From time to time we could see flashlights blinking in the tree lines and from the small villages that we were passing. I suppose the Viet Cong thought we were a North Vietnamese unit moving into the city of Hue to join the battle against the U.S. Marines. They were blinking some kind of signal to us, as we kept moving quietly along. No shots were fired at us and we kept on moving away from our defensive position and into the darkness. Our platoon was bringing up the rear of the long line of men. “B” Company’s First Platoon, my platoon, was the last platoon to leave the perimeter. First Squad was on the tail end of the column. We had walked slowly for more than an hour and were about a half-mile from our old perimeter. Those of us on the tail end of the long line kept looking back to see if we were being followed by the enemy. Suddenly we saw the trip flares going off around our old perimeter. We were able to see the VC and NVA soldiers coming out of the darkness and running in the glare of the trip flare light. They were swarming toward our old foxholes. We were still close enough to be able to see their AK-47’s in their hands as they assaulted our former positions. Some of the NVA soldiers began firing toward our old positions as they ran past the trip flares and into our old perimeter. Just at that same instant, as if by some master plan, a terrific explosion ripped through the old camp. It was like a one thousand-pound bomb exploding. Red tracer bullets were flying in all directions from the explosion. The blast was unbelievable even at our distance. Then darkness and total silence followed. Not a sound was made from the enemy or from us. We kept on walking. Then suddenly an M-79 fired! We all dropped into the mud and water waiting for the grenade to explode and for the enemy to open fire on us. The M-79 had been pointed downward and the round had only traveled a few feet before it had slammed into the mud. It had not traveled far enough to arm itself so it did not explode. Someone carrying an M-79 had failed to keep the breach open and the weapon had accidentally fired. We were back on our feet and we continued to walk with only the gentle sound of our boots sloshing in the mud and water. It was the longest walk, and the hardest thing I have ever done in my life. We took turns carrying some of the wounded men on our backs. We also took turns holding on to the handles of makeshift litters holding the wounded who were unable to walk. My shoulders were hurting so bad from the straps of my web-gear and the load I was holding in my hands that I just wanted to fall over and not get up. We kept moving forward and kept looking back at the same time, knowing the enemy would be following our trail across the muddy rice fields. After several hours we came to a small canal near an abandoned village. The point man had found a place where our battalion would be able to cross the canal with the wounded men. Though the canal was not very wide it was deep. The water came up to our necks as we waded across the canal. We had to make several trips back and forth across the canal to get everyone and all the stuff we were carrying to the other side. Tilden Mauk, one of the men in our squad stepped into a deep hole as he crossed the canal. Tilden disappeared beneath the surface. I grabbed his rifle barrel which was still sticking out above the water and pulled him up and across. We walked all night. As daylight began to turn the darkness into light we had reached the foot of a steep hill just outside of an abandoned village. On that hill was the base camp for some South Vietnamese forces. We stopped at the foot of the hill and waited until we had made radio contact with the South Vietnamese forces up on the hill. We wanted them to know that we were starting up their hill and that they knew not to shoot at us. After about thirty minutes we began to move up the hill. We knew we had to get to higher ground so we could defend ourselves when the NVA found us. As we climbed the hill we passed through the South Vietnamese outpost. They had underground concrete bunkers and defensive positions built on the lower step of the hill, which had three steps. The steps connected to each other like stair steps. We kept moving up the slope toward the middle hill. Just as our battalion made it to the top of the middle hill the enemy forces in the valley below spotted us. They must have been looking for us all night after their failed assault against our abandoned perimeter. Exhausted, wet, hungry, and cold we had kept moving until the entire battalion was on the middle step of the hill. We still had our wounded with us. It is hard to hide 450 men on the side of a rocky hill with no trees or much of anything else for that matter to hide behind. 2nd Lt. Tom Dobrinska and all of us in First Platoon were near the top of the middle hill when the enemy spotted us. We were using Lt. Tom Dobrinska’s field glasses, which by now had one lens broken out, to look back toward a large village that we had walked past during the night. A North Vietnamese flag was flying on a flagpole in front of a rather large concrete building in that village. By using the field glasses we were able to see the NVA soldiers running around inside the village. We could also see a mortar tube being set up out in an open area on the south side of the village. It was a large mortar not the smaller 82mm type the NVA normally used. The mortar tube was as tall as the enemy soldiers who were getting it set up. We could see a crew of enemy solders preparing to fire the weapon at us. We were taking turns watching them using Tom Dobrinska’s field glasses. They were hurrying to get the weapon ready to fire. Some of our men were already trying to dig into the rocky hillside. We fired our M-16’s at the mortar crew. We could see our own rounds hitting the wet rice fields a long distance before they could reach the enemy soldiers. They were out of range of our rifles. I grabbed our squad machine gun from Clarence Thorpe, who was our machine gunner. I placed the M-60 on the ground so that it was resting on its by-pod legs. I started to fire short bursts of maybe four or five rounds at a time at the enemy mortar crew. I was holding Lt. Dobrinska’s field glasses in one hand and firing the M-60 with the other. I could see my tracer rounds hitting the rice field and not reaching the enemy mortar crew. By now the enemy mortar crew was ready and they began to fire the weapon at us. Their first round hit the base of the hill with a big explosion. The next round was closer to us and farther up the side of the hill. They were getting us zeroed in and they were walking the mortar rounds up the hill toward us! Everyone was digging as fast as they could in the hard rocky soil. We had to get down to escape the exploding mortar shells. Our company commander, Captain Larry Knotts, was wounded when one of the rounds exploded near us. His radioman was killed. Captain Knotts had just taken over as our company commander. He and his radioman were right next to us on the hill. We kept on digging and prying rocks out of the ground with our entrenching tools. Using the field glasses we could see the North Vietnamese solders putting the shells into the tube of the mortar. There were several of them firing the large mortar tube. We could see the smoke from the barrel and then a few seconds later watch the shell explode near us. It was like a bad dream. They were firing at us and we were firing at them but our weapons were not reaching them. Our own mortar crew was scrambling to get our mortar tube set up. As we watched the enemy firing at us a strange thing happened to the enemy mortar crew. The mortar just exploded! I was watching through the field glasses when it happened. I saw one of the NVA soldiers drop a mortar round into the tube and then at almost the same time a second NVA soldier, who was also loading the weapon, dropped a second round into the tube. I believe that in their haste to wipe us out, they had dropped two shells down the tube at the same time. When the smoke cleared we took turns looking through the field glasses at where the enemy mortar had been. It was gone! All of the crew was gone. The shelling stopped. Our battalion commander, Lt. Colonel Sweet, was on his radio asking for an air strike on the enemy village where the NVA flag was flying. He must have been told that no air strike was available at that time. One reason may have been the very low cloud ceiling. Lt. Colonel Sweet, our battalion commander was close enough to where we were trying to dig in, to enable us to be able to hear him speaking on the radio. Even above the clanging of the fox hole shovels hitting rocks, and the frantic calls for medic, we could hear him speaking. His radio operator was changing to a different radio channel. Then we heard the battalion commander begin talking to someone else. He was giving them our coordinates on the hill and the coordinates of the village. Within several minutes we heard a large gun fire. We could tell it was a long way off and to the east of our hilltop. A large projectile whistled over the hill that we were on, and exploded in the rice field near the enemy controlled village. I am not sure who had fired the shell but it almost had to be from a Navy ship in the South China Sea near Hue. When the round exploded we could see the shock wave knock down buildings and palm trees in the enemy village. Another shell followed the first and this one hit the village dead center. By now we were able to see NVA troops running out of the large building that was near the NVA flag. They were headed for the trees in the rear of the village. Several more shells followed the first two and more buildings and trees, flew into the air. We received no more fire from the village. We kept on digging away at the hilltop. A medivac helicopter was shot down as it tried to come in and pick up our wounded and dead. A second medivac was able to avoid the anti aircraft fire and came in and made the first of several pickups. We spent almost two days digging into the rocky hilltop. Rocks, which were dug out of the hill, were placed around the foxholes for more protection. We finally were able to get positions dug into the rocky hill that were deep enough for us to take cover in. At night ambush patrols were sent down the hill and into the valley to set up their deadly traps along trails which ran along the sides of the hills we were on. One of our ambush patrols was successful in ambushing a group of NVA soldiers moving their wounded and dead away from the battle in Hue. Usually the enemy buried their dead but this dead NVA must have been a high-ranking officer since they had him tied to a large piece of bamboo and were carrying him out of the area. Every time the cloud cover would lift over Hue, air strikes would pound the area. We learned later that we were keeping the enemy from getting re-supplied from the hills to the south of Hue, in the direction of DaNang. Early one morning we could hear a supply helicopter approaching our hilltop position. The supply ship came in out of the fog and mist and landed in our perimeter. The supply ship dropped off food and ammo. The much needed supplies were kicked out of the helicopter doors and some more of our wounded were picked up and flown out. It had been days since I had written home and so I took the lid off of a C-Ration box and wrote a note on it to my wife. I put her address on the front and handed it to the next helicopter pilot that landed to unload supplies. Defensive positions continued to be improved upon. We received some metal fence posts on one of the supply ships and we placed some of them across the top of the foxholes we had been digging. We covered the metal posts with dirt filled sandbags and rocks to make a roof. We covered the roof with a poncho to keep the rain out. At long last we were able to get in out of the wind and cold rain. The weather was cold and overcast most of the time. Temperatures dipped into the 50’s at night. We finally did receive new ponchos and poncho liners from the supply helicopters that were able to land on our LZ. One supply helicopter dropped off some wool sweaters. I grabbed one of the sweaters and put it on. The sweater helped to keep me a little warmer in spite of the wind and almost constant rain. Finally some of the packs we left back at PK-17 did manage to arrive but just as I suspected all of them had been gone through by the South Vietnamese. Everything of value was missing! Several men in second platoon were working on a foxhole position next to ours. Like us, they had worked almost non-stop for two days just to carve out a hole big enough for about four or five men to get into. Nothing fancy, just a hole in the rocky ground with a sand bag roof covered with a poncho and some rocks. The squad had decided to take a break and had climbed inside their tiny bunker to get out of the wind and misting rain. They opened some C-rations and had even found some heat tabs to heat their food. As they sat around eating they began to look at a 45cal. Pistol that belonged to one of their men. It was covered with dirt, mud, and rust. I overheard one of the men say that he would take bets that that pistol would never fire again. He was wrong! As the 45 pistol was being passed around, from man to man, it fired. I thought one of them had been killed when I heard the gun shot. There were calls for a medic. I ran over to their bunker to see what had happened and to see if I could help. The 45cal. pistol, which was being passed around, had gone off and the bullet had gone through one mans upper leg near his hip. The same bullet hit another man in the chest. The second man was wearing a flak vest over his shirt mainly to help keep warm since we had no jackets or any rain gear. The 45 slug had traveled through almost all the layers of fiberglass material in the flak vest and had stopped just short of going into his chest. We pulled his flak vest and shirt open expecting to see a bullet hole in his chest. All we saw was a big red and blue spot at the point of impact. He was almost knocked out from the force of the bullet but was not seriously hurt. The man with the leg wound was sent out on the next supply helicopter. A short distance from the hill where we had dug foxholes and built bunkers was another hill that was even higher than the one we were on. It was the third step of the three step hill system. The third and highest step overlooked the hill we were on and had a commanding view of the valley toward Hue. The South Vietnamese ARVIN forces had a small force of about 20 men on this hilltop. They were to serve as a look out and also to keep the enemy from gaining the high ground from which they could fire down on the ARVIN camp or into our perimeter. Our battalion commander thought it would be a good idea to have at least one squad of American’s on top of the hill along with the ARVIN forces. He didn’t trust them anymore than we did. First Platoon was selected to send a squad to the hilltop to join the ARVINS. Second Lt. Tom Dobrinska came over to First Squad’s area to tell me that he wanted my squad to move up to the high ground on the third hill. We had just finished our bunkers and now we had to leave them and move out. My squad made the climb to the top of the next hill, which was about three or four hundred feet higher than the hilltop that the battalion was set up on. We followed a little trail up the side of the steep hill. As we approached the hill top two ARVIN’s waved at us to let us know that we could come on up. in our squad had tried to get inside the smaller bunker at the same time there would not have been enough room. Whenever the fog and rain would let up we could see the city of Hue. We were also able to see fighter-bombers and other aircraft hitting targets around the city. As soon as the daylight began to fade flares were dropped to light the battle area around Hue. The flares were dropped from aircraft flying high above the cloud cover. The flares would pop and light up and then come dropping down through the clouds on their parachutes. The South Vietnamese platoon that was stationed on the hilltop with us had taken up living in the large bunker. From the sounds that we could hear coming from their bunker we could tell they were having a good time and not the least bit concerned about the battle going on a short distance away in the city of Hue. They used candles for light inside the concrete bunker. The South Vietnamese had some pot and were in the process of getting stoned on the stuff. We ignored them and set up our own guard. We kept two men outside all the time while the other four men were able to stay out of the wind and rain in our small sandbagged bunker. It was dark and the wind was blowing hard. The cold rain, driven by the wind, went right through our wet jungle fatigues. Temperatures were dropping into the 50’s. We had no warm clothes or jackets. I was thankful for the wool sweater I had gotten from the supply helicopter a few days earlier. We wrapped our wet ponchos around us and kept watch in the rain. Finally it was my turn to go inside the bunker. In the darkness I crawled through the small entrance in the side of the bunker and went inside to wake up the next two men. When I shook them to wake them up a couple of big rats jumped off the makeshift bamboo framework they were sleeping on. After hearing the rats scurrying around inside the bunker I decided to sleep in the ditch outside of the bunker. I found a place inside the ditch where I could escape the wind. With my wet poncho wrapped around me, I sat down in the mud and water in the ditch. I tried to sleep sitting up. I couldn’t sleep. I was too cold and to wet to sleep. The rats were using the ditch I was sitting in like a racetrack to run around the hilltop. None of the South Vietnamese came out of their bunker to keep watch that night. I felt like throwing a couple of hand grenades into their bunker, step back, and watch the pieces fly. We spent two nights and one day on the hilltop. Very early on the morning of the second day we received word that we would be moving off of the hill. Before the sun came up we were on the move going down the hill. Our battalion was going to continue to push toward Hue. It was dark as we moved down the hill and headed toward Hue. We passed through several small abandoned villages in the darkness. After moving through the abandoned villages the daylight pushed the darkness away. We continued moving toward Hue. A small canal halted our movement. It was a small but deep canal or irrigation ditch. 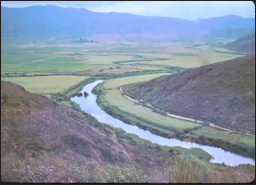 It may have been the same canal we had crossed after escaping from the enemy at Thon La Chu. The battalion commander ordered First Platoon to proceed west along the side of the canal to try to find a bridge or some other place to cross to the other side. The canal was lined with trees on both sides and we could see a small dirt path or road which ran along the other side of the canal. We followed the canal west for about 500 meters until we came to a large clearing. We stopped inside the tree line near the clearing. While staying well spread out, we sat down behind a few trees not far from the canal. We had not found any place to cross the canal. the canal. We all put down our C-rations and picked up our weapons. Soon a North Vietnamese soldier came into view. He was walking along the trail on the other side of the canal. In his arm he was carrying an AK-47 rifle and he had his army pack on his back. He was wearing an NVA pith helmet on his head. A dog was walking a short distance in front of him. I can not believe the dog did see or hear us since we were only about two hundred feet away, on the other side of the canal. We all got ready to fire as he approached. Lt. Dobrinska said softly, “Wait till I give the word.” When he said fire we all fired at once. The NVA dropped on the spot. The dog ran off down the trail. The NVA was lying still right where he fell. The battalion commander Lt. Colonel Sweet was on the radio right away. He wanted to know what was going on. We told the battalion commander what was happening and he told us to move on back down the ditch toward the rest of the battalion. Lt. Col. Richard Sweet then ordered the “A” Company commander, Captain Bob Helvey, to take some men and go down the canal in the other direction to try to find a way across. They found a small concrete bridge which went across the canal. As Helvey’s lead platoon tried to cross the bridge they were fired on from the other side. The point man in that “A” Company platoon was killed on the bridge. The enemy was in a small concrete house in a clump of trees on the other side of the bridge. Our mortar platoon had been working quickly to set up the mortar in a small clearing while we had been trying to find a way across the canal. The mortar platoon fired several rounds into the area of the concrete house to keep the NVA pinned down. Captain Helvey and some of his men managed to cross the canal several hundred yards down from the bridge. They worked their way up behind the enemy in the concrete house. Then Helvey’s men rushed the enemy while firing into the windows to keep them pined down. One of Helvey’s men threw a couple of hand grenades into the concrete house. The platoon from “A” Company killed all the enemy solders and dragged their bodies out of the concrete house and left them in the middle of the road on the bridge over the canal. The 2/12th battalion then crossed the bridge and moved up the road along the other side of the canal. I looked at one of the dead enemy soldiers laying on the bridge as I crossed the canal. Someone had put a First Cavalry patch on one end of a sharp stick and stuck the other end of the stick in the eye of one of the dead enemy soldiers. We soon came to the dead North Vietnamese, that we had shot a short time earlier. We checked to see what he had in his pack and then just left him where he was. We took his weapon and all his equipment. He had some letters and pictures in his pack. I guess they were from his family back home in North Vietnam. We continued along the road. About a mile ahead of us on this road was Thon La Chu. That was the village we had escaped from a week earlier. Thon La Chu is also the village where we buried our own dead in the mortar pit. Everyone was intent on recovering our fellow GI’s that had been killed and left behind. We came to another large open field. The road ran along the left side of the open field. The tree line on the other side of the field was the village of Thon La Chu. The battalion commander ordered our company to prepare to cross over the open area, and to secure the wood line on the other side. The plan was to use the mortar platoons to fire into the enemy wood line on the other side of the open area to keep the enemy’s heads down. We still had no American artillery support. Two rifle platoons from “B” Company, working together, would assault on line across the open field. Second platoon was to get on line and assault with First Platoon until both platoons reached a drainage ditch that cut across the middle of the field. From that point second platoon was to stay in the ditch and provide covering fire for us in First Platoon so we could go on to the enemy held tree line. The battalion commander called for artillery support from a South Vietnamese artillery battery. They were to provide us with some cover as we started across the field. The battalion commander found out that the South Vietnamese artillery battery was out of high explosive ammunition. All they had left was some white phosphorus rounds. This was to be one of those classic on line assaults, they teach you to do in Basic Training and in AIT. It is also something you never expect to really be ordered to do. Everyone is to get on line and fire their weapons into the enemy positions to keep the enemy pinned down as you rush into their positions. Almost as soon as we left the wood line, on our side of the open area, and started moving on line toward the tree line on the other side, we started receiving automatic weapons fire. There was no place to hide and no turning back so we began to return fire as both platoons ran for the ditch in the center of the field, firing as we went. I emptied the first magazine in my M-16. I hit the ejection button and dropped the empty magazine on the ground. I had a full magazine in my left hand. I shoved it into my weapon and the bolt slammed closed. I kept on firing. I had a good M-16. Smith Corona, the typewriter people, had made it. By now enemy mortar rounds and RPGs were exploding in the field in front of us. A chunk of shrapnel, which must have bounced off the dirt first, hit my flak jacket. The shrapnel stuck in the front of my flak jacket collar. I had nervously zipped my flak jacket all the way up before we had started our assault. The sharp edges of the shrapnel were stuck in my flak jacket collar and wedged against my neck. The shrapnel was about the size of a quarter. It was very hot and also very sharp. I quit firing my M-16 just long enough to pull the hot piece of metal out of my flak jacket and off of my neck. I kept on firing my M-16 as I ran toward the ditch. A new guy, who I had never seen before, had jumped up and started running with us as we had begun our assault across the open field. He was not a member of our platoon. I don’t know who he was or why he had decided to leave his own platoon when the assault started. He was on line and running with us. He was right next to me. He may have been a member of “A” Company. He was shot in the chest before he made it to the ditch in the middle of the field. I remember seeing him get hit and the blood in the middle of his chest. He fell face first on the ground. No stopping to help him, he was dead. We kept on going. You couldn’t stop! I felt like we were all moving in slow motion during the assault. Soon we were in the irrigation ditch with second platoon. We were in the middle of the open field about half way to the enemy held tree line. Second Platoon had lost several men in the assault across the field. Now we were in the relative safety of the ditch. Bullets were cracking over the top of the ditch. We could hear mortar rounds exploding in the field. There was no water in the ditch and it was deep enough to walk in without having your head above the edge. First Platoons job was to get to the wood line of Thon La Chu. 2nd. Lt. Tom Dobrinska our platoon leader called both of his squad leaders over to where he was in the ditch, and asked us who’s squad had point next. I was the leader of First Squad and a black man named James Shields was the leader of Second Squad. I said it was my squad’s turn to take point. Lt. Dobrinska told me to take my squad of men and try to make it to the wood line by going straight across the open field in front of us. The tree line was still about two hundred yards away. By carefully looking over the edge of the ditch we could see what looked like a potato patch between the ditch we were in, and some kind of concrete house or tomb. The tomb was about half way to the tree line. We decided to stay to the right of the road and try to make it to the concrete house. Second Squad was to stay in the ditch with Second Platoon and provide us some covering fire. Everyone in the ditch began to fire at the tree line as my squad and I climbed out of the ditch and ran across the potato patch toward the concrete house. We were moving fast, but it seemed like we were running in slow motion. Bullets were hitting the hills of dirt at my feet and everywhere. The concrete house or tomb was still a long way in front of us. We were receiving so much machine gun fire from the tree line, there was no way we could make it. We ran back to the ditch and jumped in. None of my squad had been hit. We had another quick meeting. Tom Dobrinska told James Shields to take his squad and follow the ditch to the road and then try to rush up the road to the tree line. Second Lt. Tom Dobrinska called in for some more artillery support. The ARVIN artillery unit called back and told Lt. Dobrinska that we were almost out of range for them. All they had left to fire was some white phosphorus rounds. Lt. Dobrinska ordered the artillery unit to try to give us some smoke cover. The burning phosphorus would make a lot of smoke and may give us some much-needed cover. The first 105 rounds were fired and they hit the rice field a long way off to our left and were of no help. We finally got the fire adjusted so that the rounds were hitting between the tree line and us. Squad leader James Shields moved his squad out of the ditch to begin their assault up the road toward the tree line. Enemy machine gun fire forced Second Squad to take cover in a another small roadside ditch on the other side of the road. The artillery rounds were still coming in to provide us some smoke cover. However they were arriving at such a low angle they would hit and skip across the field before they would explode. We thought we were going be killed by our own supporting fire. We had to get out of this field! I managed to get my squad out of the ditch and across the road and into the smaller ditch on the other side of the road along with squad leader Shields and his men. There were trees along this side of the road and we were able to use them for cover as we moved toward the enemy held wood line. The enemy machine gunners really had the road zeroed in. Two of our men were hit while crossing the road. One of the men was my good friend Robert [Bobby] John Allen from Providence Rhode Island. He was carrying the radio for the platoon sergeant whose name was Sgt. Melendez. We moved forward along the edge of the road. I found a nice big tree next to the road and used it for cover keeping it between the enemy and me. I heard Bobby Allen call to sergeant Melendez for help. He said, “Help me Sergeant Melendez!” “I am hit” “Help me.” I left my tree and went back along the road. Someone else from Second Squad helped me and together we managed to pull Bobby Allen off the road and into the ditch along side of the road. The enemy machine gun fire and our own 105mm artillery had us pined down. 2nd Lt. Tom Dobrinska called for fire support from our company mortar platoon and he directed their fire along the wood line in front of us. Lt. Dobrinska low crawled forward in the small ditch, which ran along the dirt road we had just crossed over. He found some trees to use for cover. He crawled between the trees to get a better view of the wood line. As he put his head up to try to locate the enemy machine gun position a bullet hit him in the forehead. We pulled him back behind the trees. Robert Smitherman, from Indiana, and I loaded our platoon leader onto a poncho and half carried and half dragged him along the edge of the trees until we made our way to the bank of the canal which ran along the road. Using the bank of the canal for cover we dragged the poncho, with Lt. Tom Dobrinska inside, back to the rest of the battalion. Our battalion had a medic with some real doctor training. By this time the medic had set up an aid station to treat the wounded. He had found a concrete walled house or school house back where the rest of the battalion had set up a perimeter. Smitherman and I carried Second Lt. Tom Dobrinska through the battalion perimeter to the medic station inside the concrete house. The medic went to work on Tom right away. I knew the Lieutenant was either already dead or was dying from the way he was shot. Bob Smitherman and I left the aid station and went back up the canal dirt bank and along the road to get Bobby Allen. As we left the battalion perimeter we passed an old graveyard which was near the road. There were about 10 men taking cover behind the grave markers and some mounds of dirt in the graveyard. I raised my M-16 and fired a burst into the enemy tree line on the other side of the clearing before Smitherman and I crossed the road. In doing so I was firing over the heads of all those in the graveyard. I heard someone yell, “Stop shooting!” It was the battalion commander. Lt. Col Richard Sweet, Captain Helvey, and their radio operators were in the graveyard. They were trying to direct the artillery and mortar fire into Tron La Chu. When Smitherman and I reached Bobby Allen the only place I could see blood on him was on both of his legs. He was unconscious. We picked Bobby up and put him on the poncho. Again we half-carried and half-dragged Bobby on the poncho. We went back along the side of the road and the dirt bank of the canal. We were able to again make it to the battalion aid station. It was starting to get dark as we made our way back to our men along the road. We received word to pull back and rejoin the battalion. We found the rest of our company near the small graveyard but inside the tree line. We all pulled back into the tree line on our side of the open area. We were back where we had begun our assault several hours earlier. Our mortar platoon had the mortar firing into the wood line across the clearing. The battalion commander told us to dig in for the night. First Platoon was to cover the road near where we had killed the NVA soldier earlier that day. I went out on the road, near the dead NVA, and set up a trip flare that would warn us if anyone came up the road. I returned to help dig a foxhole for the night. Suddenly the trip flare I had just set out went off. We grabbed our weapons and were ready to begin firing when we saw a pig walking down the road in the light of the trip flare. We held our fire. I went back out on the road and put out two more trip flares. This time I tied the wire about three feet off the ground. I put one across the road and one across a little path that lead to an abandoned hooch about 30 yards in front of our firing position. I rejoined my squad. About midnight the trip flare on the road went off again and we saw an enemy soldier run for cover. We fired several shots at him, but missed. He must have decided to take cover in the old hooch because he set off the second trip flare I had put across the path to the old abandoned hooch. We fired several M-79 rounds into the old hooch and all was quiet. In about an hour we heard sounds like someone working or digging near the old hooch. We tried to throw two hand grenades in the direction of the sounds. Both grenades hit trees and bamboo brush and bounced back toward us, exploding near our positions. We decided not to fire anymore unless we were attacked. We did manage to get a little sleep. It began to rain by morning. Just before first light came two of my men and I went carefully through the bamboo and brush over to the old abandoned hooch. We found that during the night an enemy soldier had stacked some bricks up to make a firing position next to the old hooch. He was gone. At first light I grabbed my M-16 and web gear and left my squad in our position on the perimeter. I made my way over to the little concrete building where we had taken 2nd Lt. Tom Dobrinska and my friend Bobby Allen, when they had been wounded. The battalion medic told me that Lt. Tom Dobrinska had died soon after we got him to the aid station. Then the medic told me that Bobby Allen was also dead. I felt like I had been shot. I knew Tom was hit bad but I did not think Bobby would die. I was really angry. Why did both of my friends have to die? I asked the medic what had happened to my friend Bobby Allen. He told me that Bobby had been shot several times through the legs and several times in his side and back. He said he had done all he could for him. A few minutes later a helicopter landed to take their bodies away. I will miss both of them as long as I live. During that morning our platoon sergeant, Sgt. Melendez, received word that he had orders to leave the field and return to base camp in An Khe. When another medivac helicopter managed to make a landing in our perimeter later that morning, Sergeant Melendez jumped on the helicopter and was gone. We were now without a platoon leader or a platoon sergeant. Specialist 4th class James Shields, Robert Waszak, and I were all promoted to sergeant E-5 on the spot by the new company commander. Robert Waszak, James Shields, and I were now running what was left of the First platoon. The next night found us in the same foxholes. We were tired, wet, and hungry. We still had no real artillery support. Also due to the low cloud ceiling and dense ground fog we were getting very little air support. Any helicopters flying into the area around Hue were receiving intense anti-aircraft fire from enemy gunners. During that night a group of men from “A” Company volunteered to go across the open field, under the cover of darkness, to scout out the wood line on the other side. They wanted to determine if the enemy was still there in Tron La Chu of if they had pulled out. Captain Helvey, the “A” Company commander, led the small group of men. After crossing the open field they walked right into the enemy positions. In the darkness one of Helvey’s men stepped on the rifle of an enemy soldier who had climbed out of his bunker and had put his weapon down to go relieve himself. When the NVA soldier tried to pick his rifle up Helvey’s man shot him with his 45 pistol. They then returned quickly to our lines. We heard the first shot and several more and expected that the enemy had spotted Helvey and his men and were now going to try to rush our positions. Helvey and all his men returned to the battalion perimeter. The next day our battalion commander Lt. Colonel Sweet was able to get some good firepower called in on the enemy positions. After pounding the enemy positions with artillery we again assaulted on line across the open field. We fired into the enemy positions as we went. There was very little return fire from the enemy. We were able to overrun the enemy bunker line. We found that the enemy had pulled back. They were forced to leave many of their dead behind. We also learned that another First Cavalry battalion, the 5th of the 7th was moving toward us and had already moved into Tron La Chu from the opposite direction. They had dug up and had recovered the bodies of our fellow soldiers that we had to leave behind when we had escaped from the NVA. Our battalion then changed directions and moved farther to the east. We were ordered to move to another hilltop that again overlooked the city of Hue and was right on an important supply trail that the NVA were using to supply their men in the City of Hue. We were to cut that supply line and keep it cut. That hill top overlooked some of the most important supply routes leading into the city of Hue. An old French outpost and fort had once occupied the hill top. Several old French concrete bunkers were still standing along the edge of the hill top. We threw some grenades into the old bunkers to kill the rats and snakes that surely were living inside. Then we moved in. We spent about 10 days on this hilltop. We ran ambush patrols along the supply trails both day and night. We kept the supply trails cut. The NVA desperately needed a way to get supplies into the battle at Hue. The NVA also needed a way to get the wounded out and away from the battle. At this time two companies of South Vietnamese Rangers were assigned to our battalion to replace some of the people we had lost since the TET Offensive had begun. Early one morning our company commander called me on our platoon radio. He asked me to come over to his command post. The captain had set up his command post in what was left of the old French fort. The company commander ordered me to go to Da Nang on the next supply helicopter. He said he needed someone to identify the body of my good friend Bobby Allen who had been killed on February 9th. I was shocked! I couldn’t believe that Bobby’s body was still in Vietnam. He had been killed almost two weeks earlier. Why wasn’t his body back home or at least on its way back home by now? I asked our captain if I could send someone else to identify Bobby’s body. I told the captain that I now had a platoon of men to take care of. Most of all I didn’t want to see my good friend Bobby’s body in some refrigerator box in the city of Da Nang. I wanted to remember him as the fun loving kid from Providence Rhode Island who had gotten in trouble with the law for stealing a car. The judge had given Bobby a choice. Go to jail or join the Army. Bobby Allen had decided to join the Army. First Platoon needed their platoon sergeant. Sergeant Rob Waszak, Sergeant Shields, and I had a platoon to look after here in the field. I asked the company commander if I could send a man from First Squad named Lynn Booth instead. He and Bobby were close friends and besides Lynn Booth had a little daughter back at home. I thought that perhaps Booth would be safer back in Da Nang for a couple of days. The company commander agreed and I sent Booth on the next supply helicopter that landed on the hilltop. Lynn Booth was gone for three days before he returned to the field. By now the fighting in Hue was going against the NVA and VC forces. The enemy supply routes had been cut and it was only a matter of time until they would be defeated. 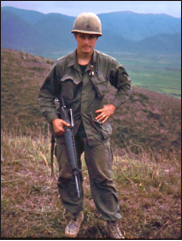 The next day our battalion moved off the hilltop and again we pushed toward the city of Hue. Several villages, which were still held by the enemy, lay between us and the city of Hue. We were receiving artillery support by now and we were using it to our advantage. As soon as we began receiving small arms fire and RPG fire from a village, we would pull back and call in for artillery support. As we approached one village, held by the enemy, we began receiving intense small arms fire. We pulled back and called for fire support. Back at some fire support base an 8-inch artillery unit answered our call for help. Several big 8-inch shells whistled over our heads and slammed into the village. Trees flew through the air like tooth picks. The noise from the exploding 8-inch shells caused one of the guys in another company in our battalion to go crazy. He started screaming and had to be held down and restrained while the medic gave him a shot of morphine, which made him stop yelling. He was later medivaced out. Before we could enter the village we had to cross another small drainage ditch or canal. The ditch was about fifteen feet wide but the water was deep. The South Vietnamese Rangers we had with us fashioned a bamboo bridge out of some long bamboo poles that they had cut and strapped together. When the Rangers had the bridge ready we called in some more artillery fire and blasted the village again. We all opened fire into the enemy village and the ARVIN Rangers ran forward to the canal with the make shift bridge. As they threw the bamboo bridge across the canal they were met with a hail of automatic weapons fire from the village. Two of the ARVIN Rangers were wounded. The other ARVIN Rangers dove for cover. First Platoon ran across the bamboo bridge, firing our weapons into the village as we ran. My squad took cover behind the dirt wall of a hooch with a grass roof. We were still receiving small arms fire from somewhere in the village. The NVA then fired an RPG at the hooch we were taking cover behind. The rocket hit something inside the hooch and exploded. None of my squad was injured. The roof of the hooch was on fire as we fired around the ends of the wall and into the village. The rest of our platoon was rushing across the bamboo bridge and firing as they ran. The enemy fire stopped and we pushed into the village. We found an unused RPG round sitting straight up in the middle of the trail which ran through the village. Knowing it was some kind of booby trap we stayed a long way away from the RPG round, as we walked past it. In that village we found medical equipment for giving blood transfusions and lots of medical supplies and bloody clothing and used bandages. This village must have been used as a medical hospital for the enemy wounded during the battle for Hue. We found a number of dead enemy soldiers that had not yet been buried. One more village stood between us, the Perfume River, and the city of Hue. Our company sent out patrols to scout out the area on either side of the village. While scouting the area my platoon came across a large trail that seemed to come out of the city of Hue. I put some of my men on both sides of the trail in the bushes and behind some trees. I was standing behind a large tree that was close to the side of the trail. I got out my map of the area to try to determine where the trail went. I looked up from the map just in time to see two people coming down the trail toward us. I motioned for everyone to stay down. I could see two young men walking quickly along the trail and directly toward me. They were not carrying any weapons or packs that I could see. When they were about twenty feet from my tree I stepped out in front of them with my M-16 aimed right at them. They put their hands up and stopped. I guess the enemy units were trying to evade our forces and get away in small groups of two or three at a time. We captured these two and tied their hands behind their backs with some poncho strings. We ripped their shirts off. Both of our POW’s had marks on their shoulders and backs from carrying packs or weapons. Perhaps they thought we would think they were just civilians from Hue. Their plan did not work. Our battalion pushed through the last village standing between us and the city of Hue without firing a shot. The TET Offensive of 1968 was over. The enemy forces had withdrawn from the battle around Hue. We were standing on the banks of the Perfume River. The walled Citadel of the old Imperial capital was across the river from us. Our battalion turned north and began the long walk back to Camp Evans. The month of February was drawing to a close. We had been fighting the battle for control of the City of Hue for a solid month. It was a long walk back to Camp Evans. It took over two days. Civilians came out of where ever they had been hiding and were back traveling along Highway One. Our platoon stopped along Highway One and set up a perimeter for the night. We were about half way between Hue and Camp Evans. I had my platoon dig in near a small village along side of Highway One. I was the platoon sergeant for First Platoon at this time. Rob Waszak was the acting First Platoon leader. We dug a fox hole and put up a hooch. I found some water in an old well near the village so that I could wash and shave my face. I had not been able to wash or shave in about a month. I took off my shirt and hung it on the hooch and started to shave. A young boy and his sister came out of a small village near where we had put up our hooch. The young boy had a chicken that he wanted to sell us. I got my camera out of my shirt pocket and took his picture. I didn’t want his chicken. I think the chicken was his pet. While I was taking this kid’s picture his sister was taking my watch off of a button hole in my shirt collar. Then she tried to sell us some candles. We didn’t need any candles either. By the time I finished shaving the kids were long gone and so was my watch! The next day we again moved along Highway One, back towards Camp Evans. Our battalion numbered just over two hundred men. We had taken over 50% casualties during TET and the month long battle near the City of Hue. As we walked along both sides of Highway One, on our way back to Camp Evans, I remember hearing a helicopter flying low and coming in our direction. I looked up and saw our battalion commander, Lt. Col. Richard Sweet flying low over us in his command helicopter. We must have looked like a rag tag bunch to Lt. Col. Sweet that day as he looked down at us. I looked up and I saw him salute us as he flew away. He deserved to be riding. Our battalion had accomplished our mission. Lt. Col. Richard Sweet and Captain Robert Helvey’s bravery and leadership had saved all our lives.